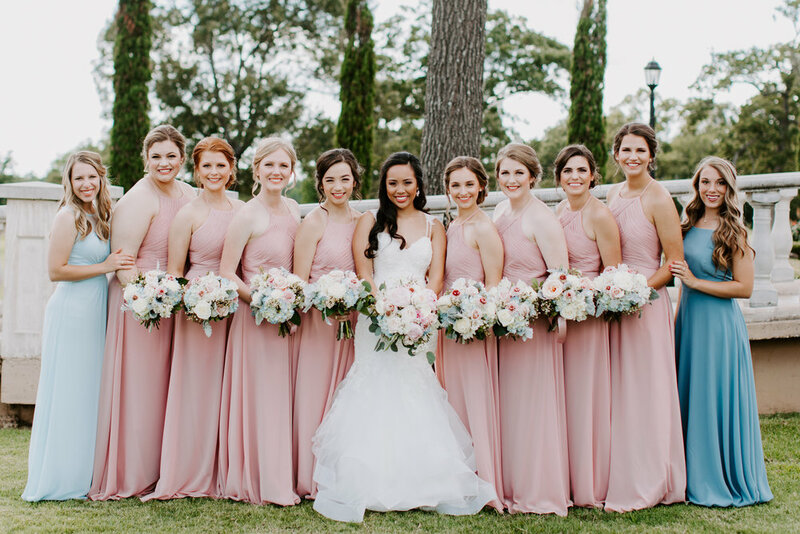 An intimate home wedding was just what this sweet southern bride wanted. Maribeth, an art teacher, and Chris, a musician, chose to celebrate with family and close friends at her parents' home in Chandler, Texas. I was the florist and wedding coordinator for this wedding and it is always a pleasure to get to see all the details come together and be a part of the celebration to the very end. Maribeth and her dad constructed the arch for the ceremony from branches off of their farm and I had the pleasure of decorating it with vines, eucalyptus, springerii fern and and lovely flowers. The tones were soft and romantic. Maribeth wore a veil for the ceremony and then changed to a floral ring that I created for her to wear during the backyard reception that followed. 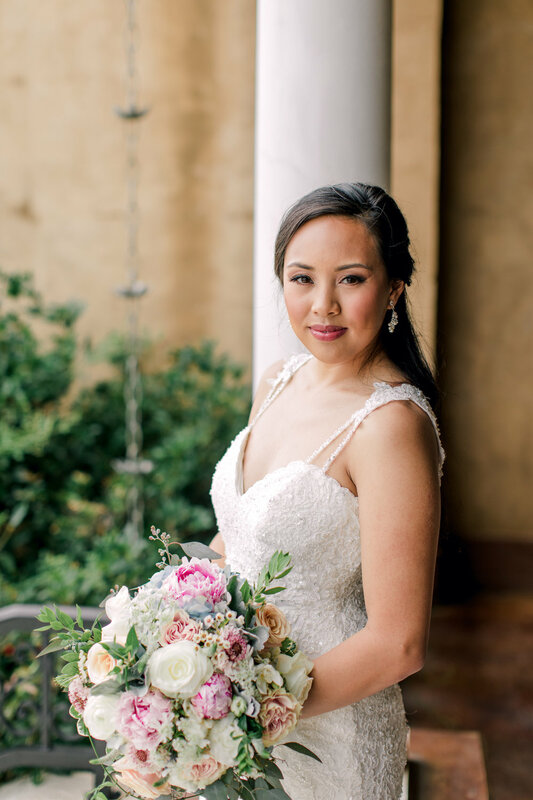 Her bouquet featured pink peony, scabiosa, hydrangea, garden roses, and a touch of succulents. Her three nieces were the sweetest flower girls with the floral rings I designed for each one. They passed out cones of rose petals for the guests to toss at the end of the ceremony. The backyard reception was catered by a local Mexican food restaurant. (In Texas, we love our Tex-Mex at any celebration!) Tables were set with crisp white tablecloths and mason jar centerpieces of hydrangeas and roses on woodslabs, for that added rustic charm, and surrounded by mercury glass votive candles. My favorite part of this evening was seeing the groom join this band of friends from around the country and sing his heart out to his precious bride. The bride's father even joined in with a song of his own. Champagne was poured, guests sang and dance and the fireflies lit up the night. It was like a summer dream! Special thanks to Tara Smith Photography for the lovely photos! 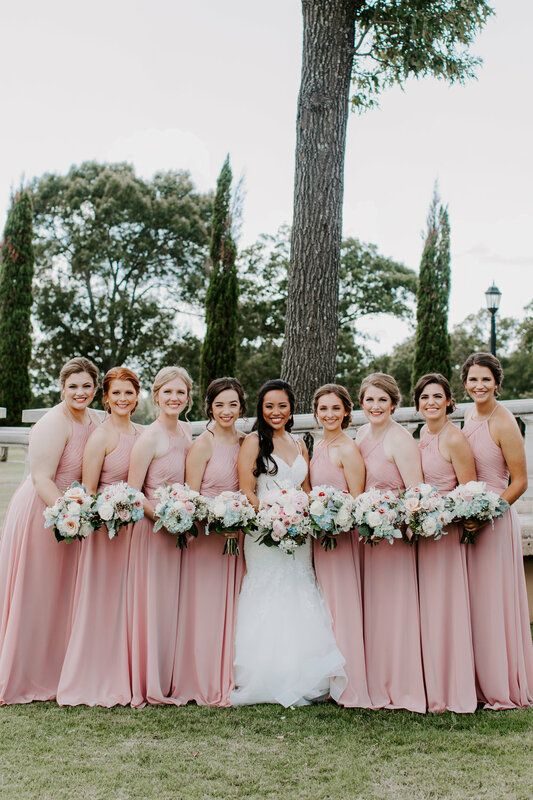 Navy, gray and white were the theme colors for this East Texas wedding. Jane wanted an all white bouquet with lots of flowing greens. The bridesmaids bouquets also coordinated with hers in this monochromatic style. The bridal bouquet features creamy white David Austin Garden roses, with a fragrance so yummy you just want to eat them! In addition the bouquet also has hydrangea, scabiosa, rananculus, freesia, and green hypericum berries to give the bouquet a lovely variety of texture and movement. Lanterns with touches of greens lined the aisle and were used on tables in the reception following the ceremony. Simple mercury glass candles surrounded in greens on crisp white tablecloths added to the simple elegance of the day. The beautiful photography is by Noreen Nartia of Capturing Me Photography. Venue is Centaur Arabian Farms in Flint, Texas.